This was the question that Maria Simoncini asked often to Dino Gavina – the subversive entrepreneur, so he liked to be defined when he gathered his staff to ask for an opinion. In fact, he liked to do everything or almost everything as he pleased, the “aesthetic worker”, as the young Vittorio Sgarbi describes him in the preface to the book “L’avventura del Design: Gavina”, published by Jaca book: the industrialist that deals mainly with everyday life, the main character of the “home landscape”. It makes me think that, when it comes to landscape, the region Marche is always involved, I don’t know why. Since when I was a child I had to deal with Dino Gavina’s furniture, indirectly. My godmother and friend of my older sister ran and still does a beautiful furniture store in the old town of Ancona, where they sold these strange objects that aroused great curiosity for me. 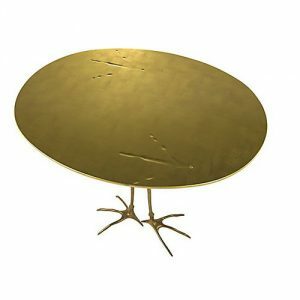 I was ten years old and the table with hen paws (traces of Meret Oppenheim, inspiration for Man Ray) transported me into the world of Walt Disney’s “Fantasia”, the movie I had seen in those days, I could imagine that from all of a sudden it could turn round in a pirouette starting to dance. It was in the early Seventies and you could breathe freedom and desecration spirit, which always follow a period of extraordinary economic well-being, lurking in everywhere, even in my hometown Ancona. I could see this in my family, since my older brothers were all trying to break up with tradition, starting from the furniture. 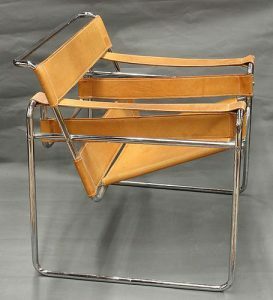 My sister, when she earned her first salary as an employee, completely changed her bedroom: on the beautiful granite floor of the Thirties she applied a red wall-to-wall-carpeting, bought a strange wicker bed from his fellow furniture maker, replaced the abat-jour with a “Flos” (a steel wire on which a removable lamp runs). I looked up at her in ecstasy. It was these objects that attracted me, languages ​​that came from a prepositive north, as I was told, from the rich Milan that was spreading new artistic values. While my grandma / aunt brought me to see the tomb of Canova in the Frari church in Venice, the young crazed in the family showed me a reflection of a world of ideas that came from these strange multifaceted objects, some even equipped with fur, in beautiful show in the nearest shop. I could never imagine that many of these pieces of furniture were not manufactured in the faraway Milan: they were manufactured in my region Marche instead, and more precisely in Calcinelli, very close to Fano, and the factory was called Simon International. The company Simon International was funded in 1968 by the entrepreneurial experience of Gavina Spa, following the long collaboration with Maria Simoncini, from which the name and its managing director. Gavina spa was later sold to Knoll with the intention of combining finance and ideas with Dino who becomes responsible for the image of both companies, but shortly afterwards he realizes how much difficult it was to combine and perhaps that is why Simon International was funded. An operation stemming from an “Ultra-rational” project, a term that expresses the will to go beyond rationalism, while maintaining the rules of industrialization, and which revises shapes and dimensions. From here the rules of Italian design get laid down, which, according to Gavina, is nothing more than an industrial project. Dino Gavina is the pure expression of the factory. Of ideas. Ideas that can become real only when shared with other ideas. It is profitable and long the collaboration with Carlo Scarpa – this delightful friend I use without him knowing it – he asserted. – Dino, I made a wonderful table! – exclaimed an enthusiastic Carlo Scarpa – its weight is 300 kg! Americo Moretti, who worked as salesman in the Nineties, tells me how was the work environment at SIMON: “At that time around 80 workers were working in the factory, and only in the offices we were fifteen. I was hired by Dino Gavina in person, even though I came from the insurance field. […] Her working partner Maria Simoncini told him: “Dino, he has no experience in this field!” and he replied “This is much better! He has a cleaner and more receptive mind”. From Simon’s history emerge significant moments in the development of Italian design furniture from the Seventies, and they always have to deal with the industrial production method. Next to the Ultra-rational is Kazuhide Takahama, a Japanese architect who will work with SIMON for a long time and will also design the factory. The famous Tulu chair was designed by Takahama and developed in harmony and at the same time of the famous Doge table, and Carlo Scarpa chose the chair for that table. Carlo Scarpa and Kazuhide Takahama thus became the center of gravity of the new company. Great stuff, indeed. The furniture made of poetry or mutant furniture, those that in addition to responding to a functional need, also respond to the need for a poetic presence at home. Ultra-furniture’s artwork strengthens the partnership with artists such as Man Ray, Sebastian Matta, Meret Oppenheim. Who does not remember the mirror “les grands trans-Parents?” and the “MAgriTTA” armchair, Sebastian Matta’s homage to Magritte, the one with the green apple and the bowler hat. And Ron Ron’s armchair of 1972, an armchair / animal fitted with tail? The subversive Dino Gavina, that is how he liked to be introduced, is constantly searching and in constant contact with many other artists: Marcel Duchamp and Marcel Breuer and Lucio Fontana, with brothers Castiglioni, Alberto Giacometti, Novello Finotti, Allen Jones, with architects Ignazio Gardella and Luigi Caccia Dominioni. “Working with him was amusing but also very challenging,” Moretti says, “every day was different from the others”. Another sign, another industrial adventure: the Meta-furniture operation in 1974, or the production of a kit for the manufacturing of poor and essential furniture – aesthetics guaranteed. Of the series: “Rich people should get rid of the rich’s kitsch and the poor should do the same as well, Meta-furniture proposes and adapts, alongside the works of famous designers, the anonymous project.” A phenomenon that anticipates the times and ten years later there will be the explosion of the TV commercialization of the kitsch furniture at a low price. 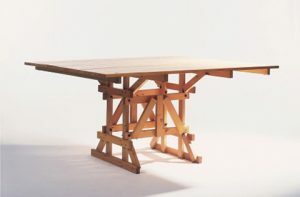 There are furniture with two kits: 1) one with tables to compose and 2) finished furniture. Socially, one cannot go any further, he says. 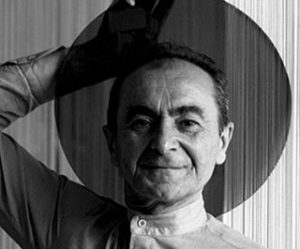 “True happiness is to have nothing more than what you really need.” There are many models of Enzo Mari and Carlo Scarpa, which conclude with an exhibition at the Galleria in Milan in 1974 with a catalog of the Duchamp center “proposal for car design”. What Gavina emphasizes and develops is the relationship between industry and the Arts. In Bologna he attended the theatrical circles where he found Damiani and Bolchi, visiting museums and art galleries continuously. The places of Dino Gavina, from his house in Foligno, Bologna, Fano, Milan, Turin, Florence turned into non-traditional containers of artistic happenings. In Rome he opens an area in Via Condotti where guests do not see his furniture, but Marcel Duchamp’s “ready made”, which then says that “it was the most beautiful showroom I ever had”. In 1969 it was officially formed the Duchamp Center in Bologna San Lazzaro. “With some resources instead of buying an apartment – says Gavina – I decided to set up the Duchamp center. Although after a while, I could see too many bad artists. The mediocre people produce only problems and of course, they are never satisfied. If a person has qualities he is always apart, he does not commercialize to show, he studies instead, meditates, works: so he has to be researched and found”. What a surprise to read these words, in an era where everyone is trying to show off and get acquainted, to emerge, the aesthetic industrialist, gives us a lesson on how to recognize the one who has more to say than the others but does not know it. And I recall the first words of E. H. Gombrich in his “History of Art:” There really is not a thing called Art. There are only artists: men who once painted the earth to the best of the bison shapes on the wall of a cave, and today they buy the colors and draw advertising posters, and in the course of the centuries did several other things”. Today, despite the official calls from the political world on the synergy between Arts and industry and the benefits that it can take from the tax deduction, entrepreneurs such as Dino Gavina have literally disappeared. It is to my mind that we have come to true platonic dualism between spirit and matter, despite the recall of unity from the New Age of Hindu origin. It’s not a good sign. Today’s society drives us to segmentize our work, because every activity is increasingly complicated by an increasingly elephant bureaucracy that is alienating us. And it sends us directly to a new Middle Ages. All I have to do is remember those times with nostalgia, made of risk and artistic dangers and of men who knew how to dare: the Italian country that no longer exists, but in those times, the region Marche has played a major character indeed.